Do you know your Spätzle from your Nudeln? Do you prefer a potato salad or a lovely Kartoffelpuffer? No idea? Well, we can help you out! 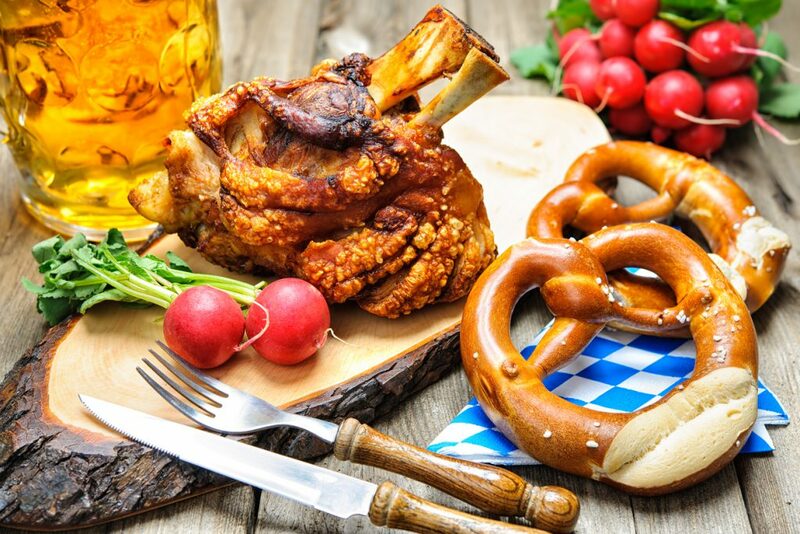 With so many German dishes to choose from, can you pick your favourite? At Lingoda, we all love food. From vegans, to meat eaters, the Lingoda team like flavour and variety! Germany is famous for its traditional dishes, and many have been updated to cater for alternative lifestyles and dietary requirements. Homely, rich and hearty, Germans know how to cook a good meal. 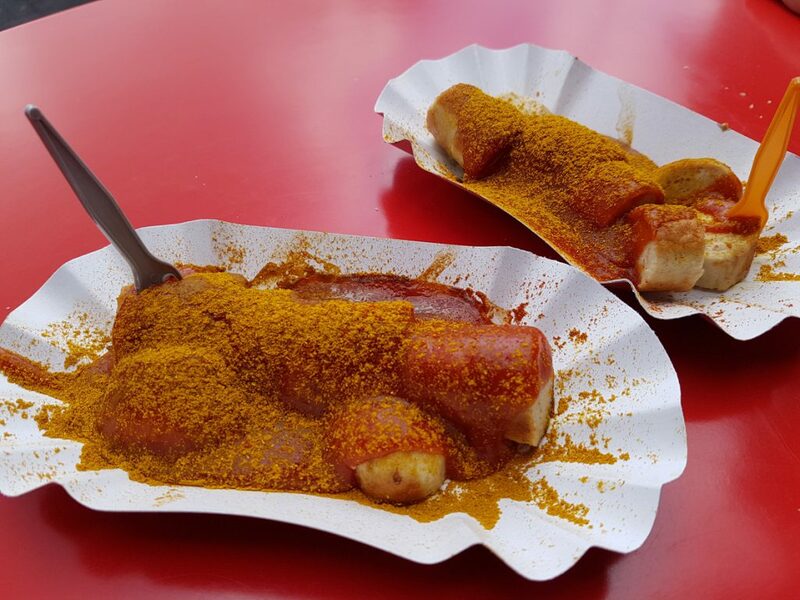 Berliners and tourists love Currywurst so much that the capital now has its very own Currywurst Museum! The famous sausage and sauce fast food combination was the invention of Herta Heuwer, a Berlin resident. In 1949, she managed to obtain some ketchup and curry powder from some British soldiers in the west of the city. She then mixed the curry powder and ketchup together and poured it over grilled pork sausages. Herta sold the Currywurst at a street stand in Charlottenburg. Nowadays, you can buy the dish in many restaurants and at street food stalls across the city. Vegans, vegetarians and meat eaters alike love this dish. 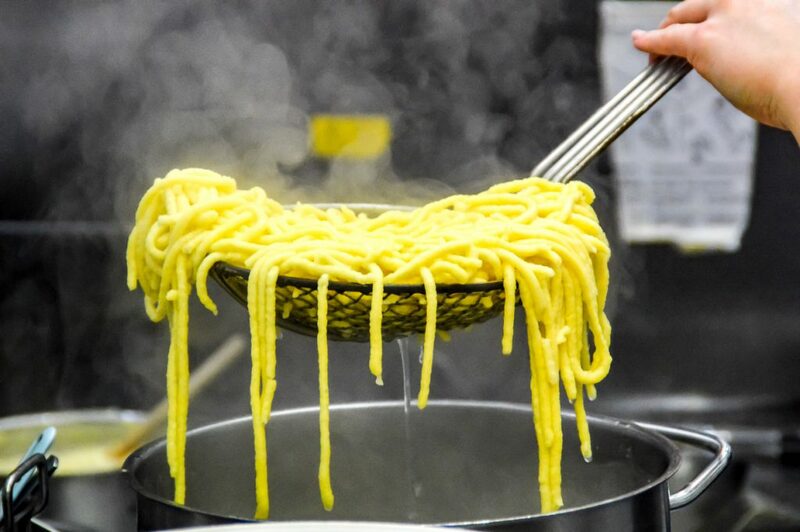 Spätzle is similar to pasta, and the original recipe is made from a combination of eggs, flour, salt and a dash of fizzy water! It’s one of the country’s most popular and versatile dishes. Spätzle is often used to bulk up soups. It can also be transformed into a main meal by adding cheeses, meats and sauces. Yummy! Leberkäse is a popular snack often found in bakeries. It can either be eaten alone, or with a crusty bread roll. 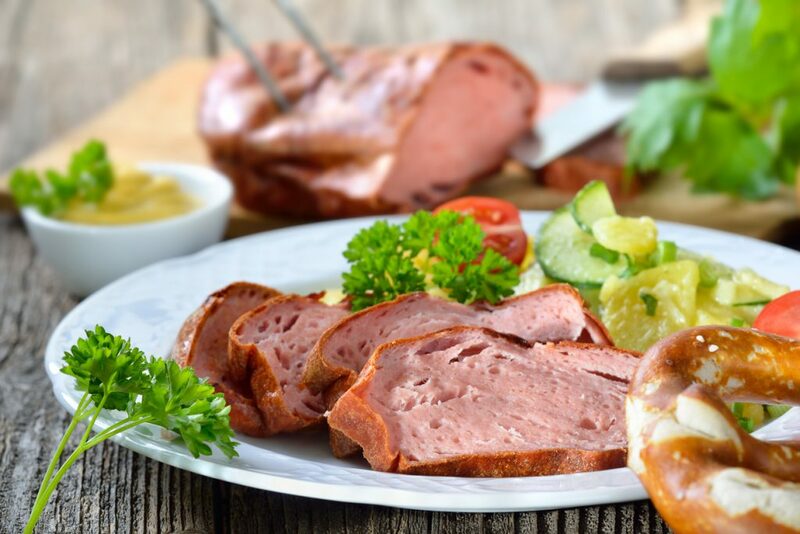 Leberkäse is made from corned beef, pork and bacon. It was invented in 1776 and has remained popular ever since. There are other variants of the dish, which include adding cheese, peppers and onions. Most of the time, you will see German’s eating it like a thick sandwich filler. 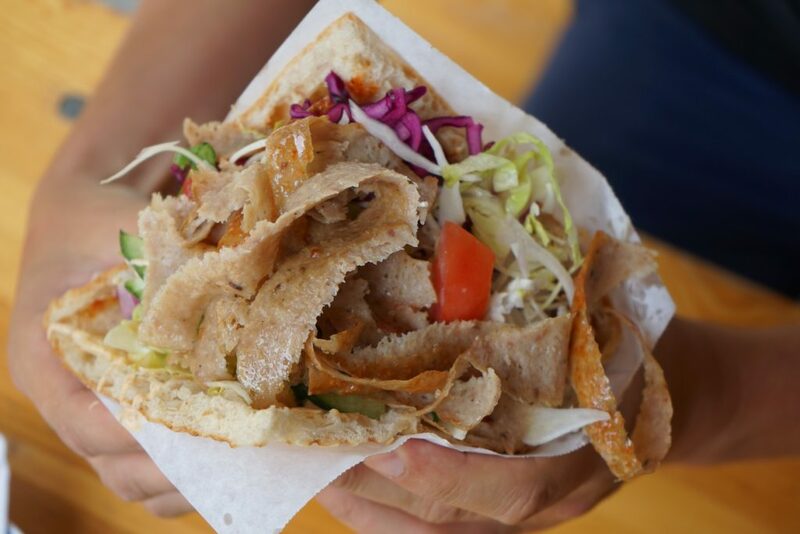 No visit to Berlin is complete without trying one of their famous Döner Kebaps. Legend in the city has it that the meaty dish was created, in 1972, by a Turkish worker called Kadir Nurman. Nowadays, there are many variants, with vegetarian options especially popular. So, if you’re looking for a quick snack, or a treat after a night out clubbing, you’ll find a kebap shop on almost every street corner in Berlin. 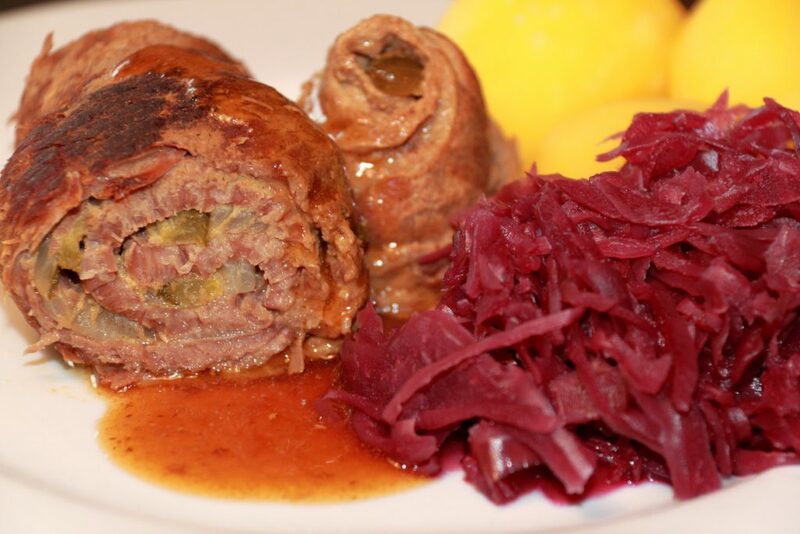 This beef roll dish hails from Saxony. It’s the perfect meal for a cold winter’s night. And there are plenty of those in Germany! A typical Rinderroulade is packed full of flavours! The meaty roll is usually teamed up with potatoes, dumplings, red cabbage, and gravy. It’s the closest thing to a typical English Sunday roast – minus the Yorkshire puddings. 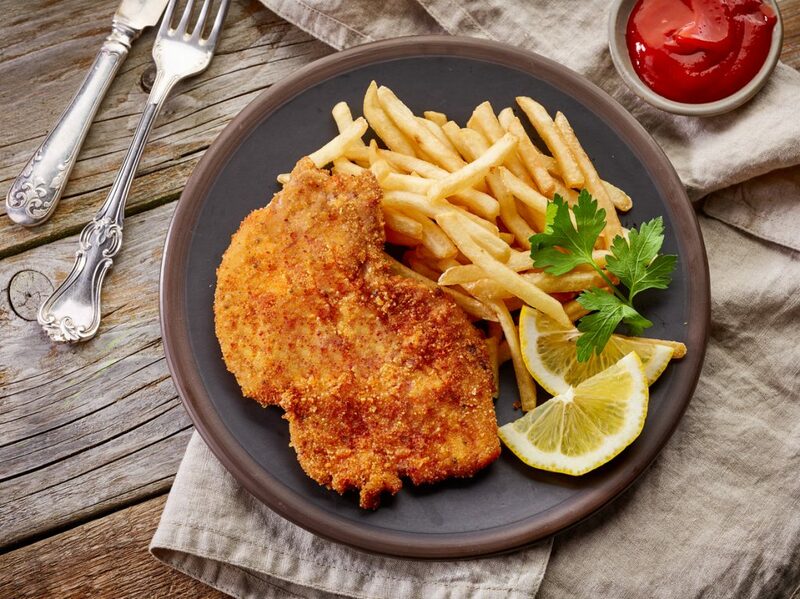 Orginally from Austria, Schnitzel is possibly one of Germany’s most famous dishes. It’s made using either veal, chicken, mutton, beef, turkey, reindeer, or pork. The dish comes breaded and is usually served with fries and a side salad. Most people outside of Germany have heard of the wiener schnitzel which is made from a thin slice of veal. The wiener schnitzel is one of the national dishes of Austria but is a firm favourite across much of Europe and North America. 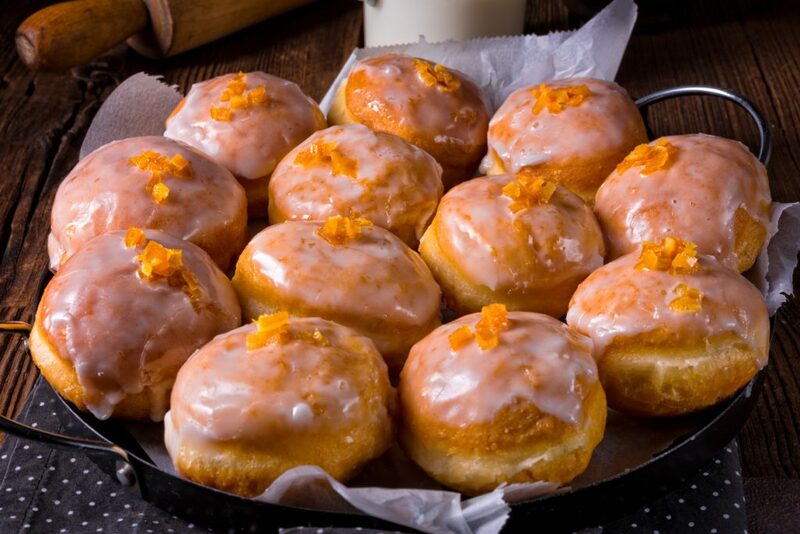 Otherwise known as Pfannkuchen, the Berliner is a traditional German pastry. It is similar to a doughnut and is usually filled with marmalade, jam, or mustard! Yes, mustard (here’s why). On New Year’s Eve, some Germans fill one of the Berliners with mustard, and the person who bites into it will have good luck for the rest of the year. You can find the simple snack in most bakeries across Germany, including vegan friendly versions. 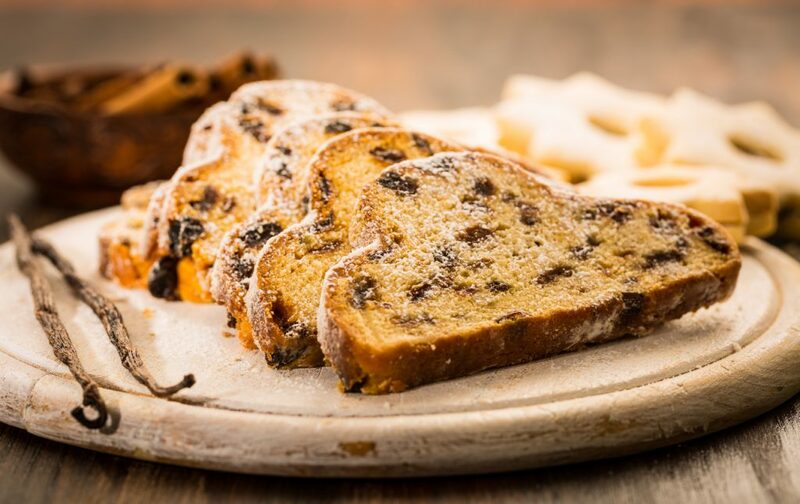 Stollen is a tasty dessert which is eaten around Christmas time. It’s a delicious bread made from dried or candied fruit, nuts, spices (including cinnamon), and marzipan. Stollen originates from Dresden. The city celebrates the dish every year by baking a huge Stollen, usually weighing around 4 tonnes! It tastes great with a warm drink, or even a Glühwein! Germans know how to make a good Käsekuchen (cheesecake)! The recipe is quite simple consisting of quark, cream, flour, eggs and sugar. Best served with a large cup of coffee, it’s wonderfully fluffy texture is thanks to the quark. If you fancy trying one for yourself, you’ll find Germans enjoying their coffee and cake most afternoons. 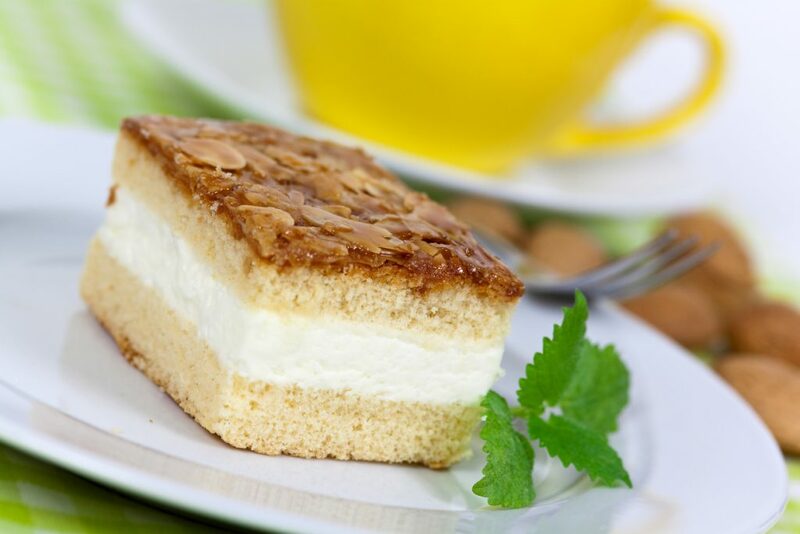 If you love buttercream, vanilla custard, and caramelised almonds, the Bienenstich (Bee sting cake) is for you! But you really do need to have a sweet tooth. Bienenstich is comprised of three layers: the honey glazed topping, the creamy smooth filling, and the cake dough. 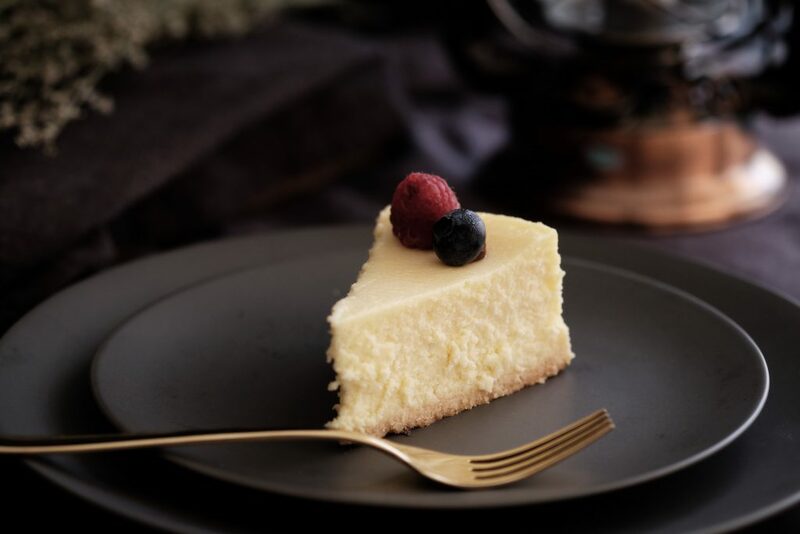 Legend has it that the baker who invented the cake was stung by bee who was attracted to the honey topping – and this is where the cake gets its name! So there you have it – our favourite German dishes and desserts. If you’d like to find out more about the wonderful world of German culture, and the language, check out our language pack: Move to Germany with Lingoda – a set of 30 lessons, aimed at expats living in Germany and other German-speaking countries. From settling in, finding a flat and getting a job, to exploring your new home and making new friends, our teachers will help you feel at home in no time at all. Alternatively, you may want to try our free trial class! Find out more on our website today. In the meantime, what are your favourite German foods? Have you got a recipe you’d like to share with us? Let us know via our Twitter, Instagram, VK or Facebook pages! We would love to hear from you.